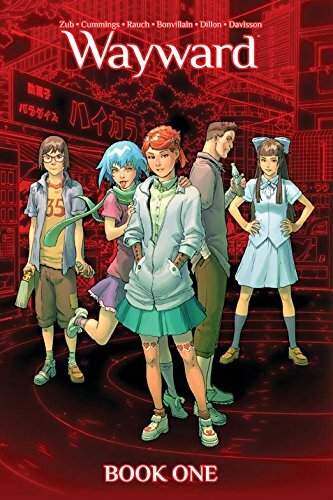 Rori Lane is central to everything about Wayward, a teenager with an Irish father and a Japanese mother who arrives in Tokyo to reconnect with her departed mother after unspecified disagreements with her father. Not long after arrival she’s attacked by monsters, rescued by a new friend Ayane, and now able to see the threads connecting everyone and everything, which guide her to other teenagers with super powers awakening. These are connected to ancient Japanese magic, Yokai, creatures of Japanese myth. Artist Steve Cummings is really impressive, all the more so considering that before Wayward he was little known. 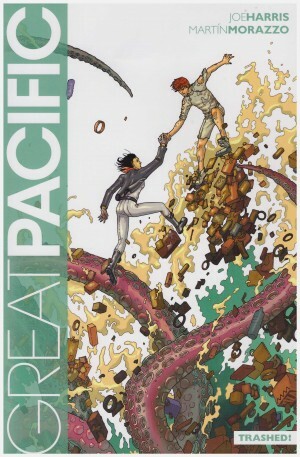 He has a figurative approach to his cast, who look like the teenagers they’re intended as, not scaled down adults, and drops them into impressively detailed locations, and convinces with the idea of ancient creatures suddenly manifesting in an otherwise well realised and modern Japan. 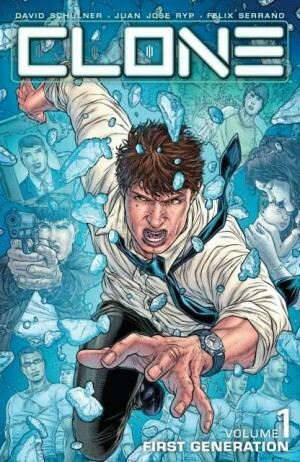 Cummings borrows from manga’s delicacy without diving in headfirst, and has a sense of page layout drawn more from better American action comics. It’s spectacular fusion at its best, and only improves as the series continues. The process pages include plenty of his sketches, covers and other illustrations, many of which are to drool over. Credit should also be given to the well considered, mood-shifting colours supplied by Tamra Bonvillain. Wayward is a series that builds into something impressive, but from a slow start, and it’s those faltering two opening volumes collected in this first of three deluxe editions. 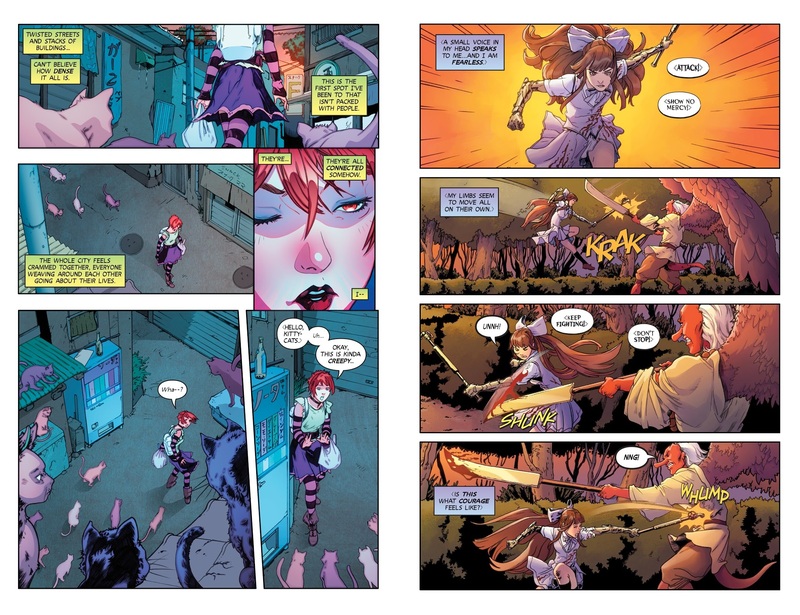 The skill of Cummings is matched by the ambition of Jim Zub, but over the opening chapters dragged down by Zub’s not being quite able to formulate his plot adequately, and big problems with the dialogue. So often over the first few chapters the reading grinds to a halt due to some awkward phrasing that reads as dialogue rather than anything people say. “At this point I think we need to embrace the weird”, says Rori, which would be fine if not followed by “high-five it, give it our phone number”. It’s being clever at the cost of a credible personality. It’s something that gradually tones down, and by the end of this collection Zub has just about achieved the right balance, and it doesn’t intrude into Book Two. Combining what was published in paperback as String Theory and Ties That Bind also highlights the weakness of Zub repeating a formula to plot the series. 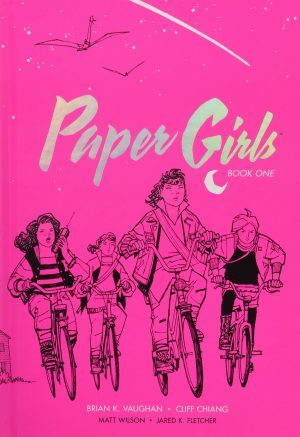 We twice have an uncertain teenage girl beset by mystical attackers who awaken powers within her, after which she discovers allies and everything builds to a major battle with a deadly foe. This oversimplifies, but the parallels are obvious. However, this is the groundwork that serves the remainder of the series, and there’s enough personality, exotica and spirit that you’ll want to read more, and for that Zub ups his game. For anyone interested in the background to the series, this Deluxe Edition is backed-up by an extremely long essay by Zub explaining his influences and thoughts. There is an element of “I’ve done my research and you’re going to know about it”, but Zub’s enthusiasm transmits, and anyone wanting to will learn a considerable amount.